These images, taken in Lancaster, PA between 2004 and 2010, show contemporary Amish men, women and children. While the Amish generally do not pose for pictures, some will cooperate with photographers they know and trust. Local freelance photographer Daniel Rodriguez has developed close relationships with a few Lancaster families, and he has been capturing images of Amish and Old Order Mennonites for several years. With sale bills in hand, these men watch and evaluate horses at a public auction. 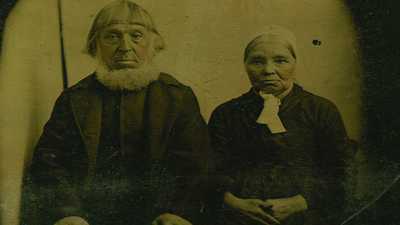 By tradition, Amish men grow beards after marriage, but not a mustache -- an old European tradition associates the mustache with military officers. 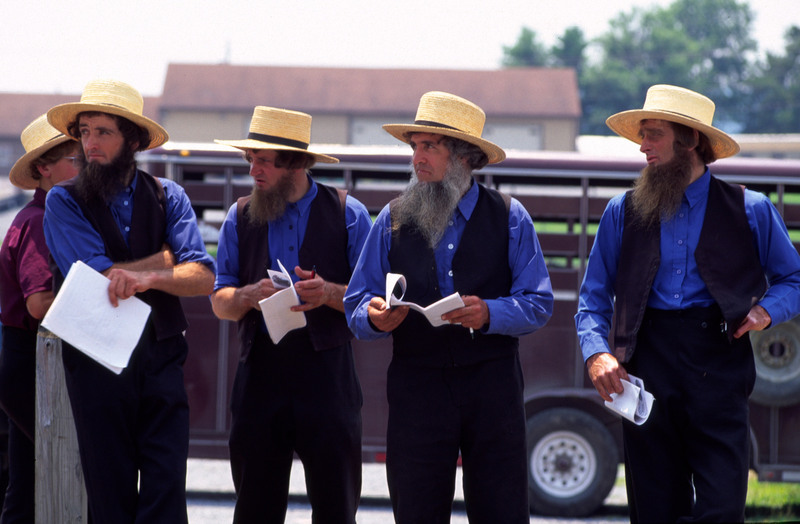 The color and style of men's clothing varies among the various Amish groups. September 2004. 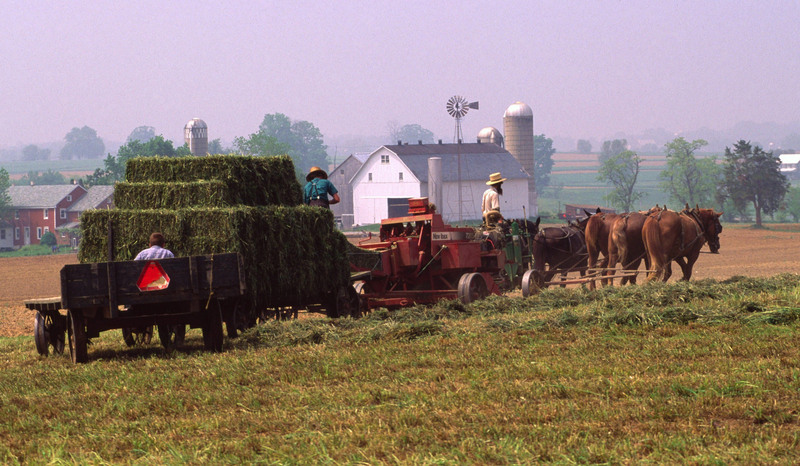 Most Amish groups use horses to pull harvesting machinery in the field. This family is baling hay to feed their cows in the winter. The horses are pulling a gas-powered hay baler on steel wheels. May 2004. Some Amish groups permit bicycles, but others only use scooters. 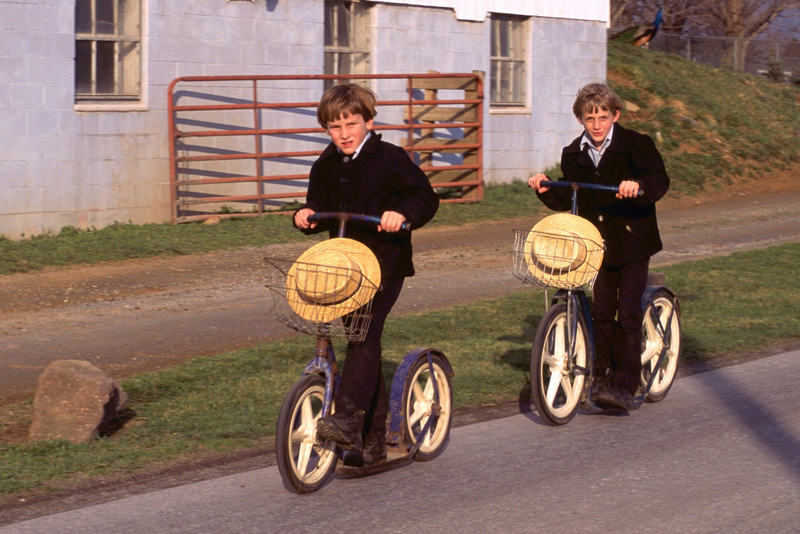 Both youth and adults use scooters for local travel in the Amish community near Lancaster, PA. c. 2005-07. 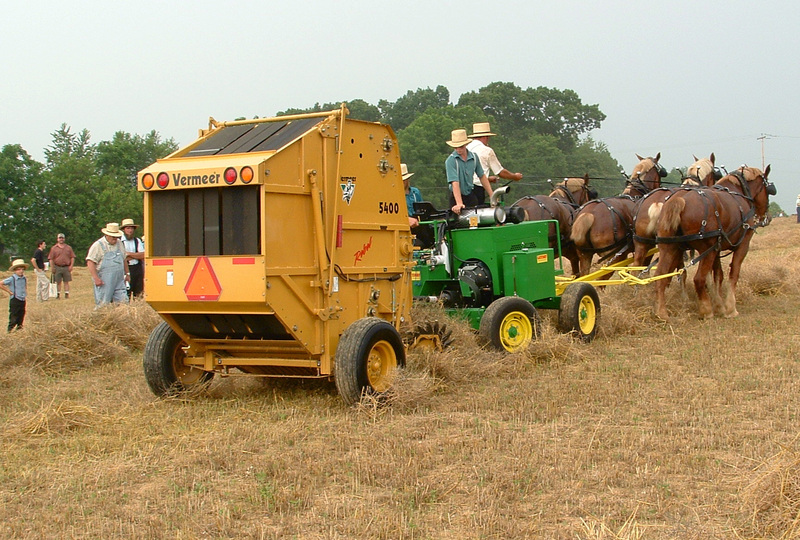 Amish men demonstrate a new baler powered by a gasoline engine at the annual Horse Progress Day. 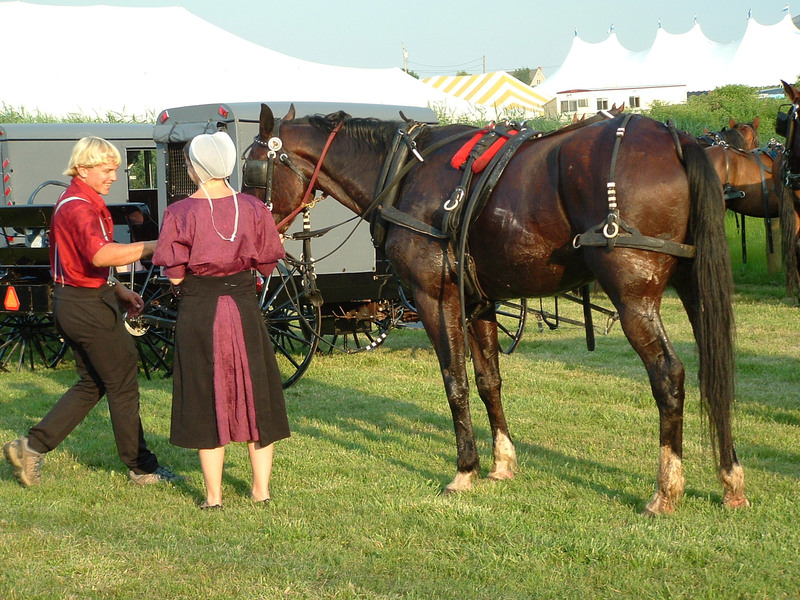 At this popular event, both Amish and non-Amish equipment manufacturers demonstrate new state-of-the-art machinery designed to be pulled by horses. June 2005. Even Amish women who do not live on farms are adept at handling horses and driving them on the road. Horse-drawn transportation slows down the pace of Amish life. July 2006. 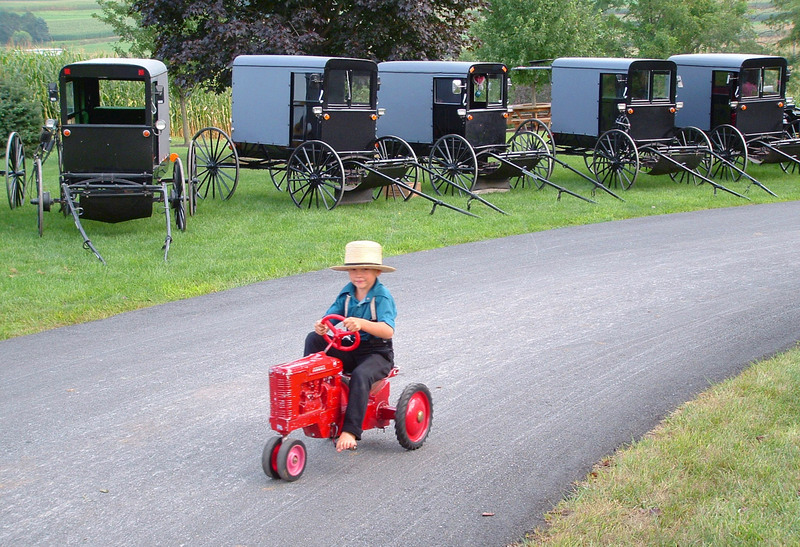 Amish children are increasingly exposed to modern technology. These boys at a public auction are playing on a forklift owned by a non-Amish person. Greater exposure to outside technology increases the temptation to use it. September 2006. These Rumspringa-age teens flirt as they tie their horses prior to a social gathering. The color and style of clothing for teenagers is quite diverse across the various Amish groups. 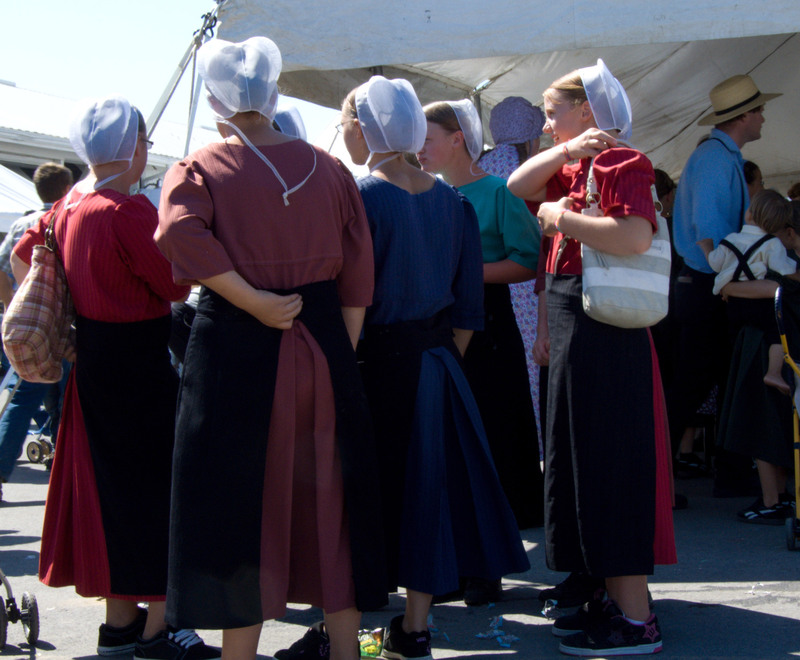 Some youth wear "English" clothing on weekends during Rumspringa. July 2006. 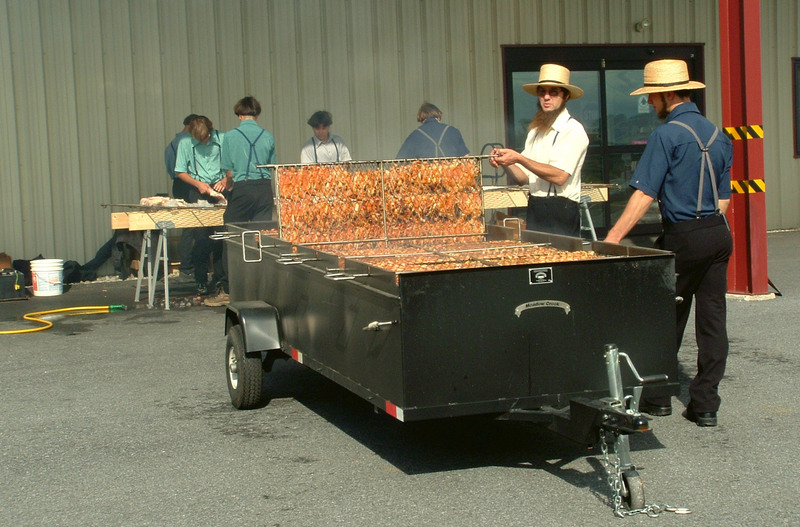 Amish men prepare and barbecue chicken for a community event in September 2006. This mobile barbecue unit was manufactured by one of North America's approximately 12,000 Amish-owned and operated small businesses. Children are typically dressed in the traditional garb of their parents. 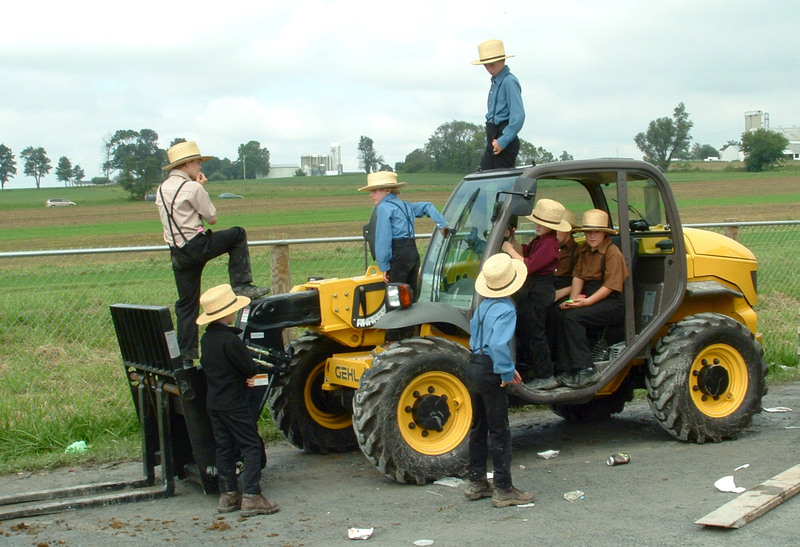 Some Amish groups permit them to play with store-bought toys such as this rubber-tired tractor, although farmers would not be allowed to use a tractor in the field. September 2006. 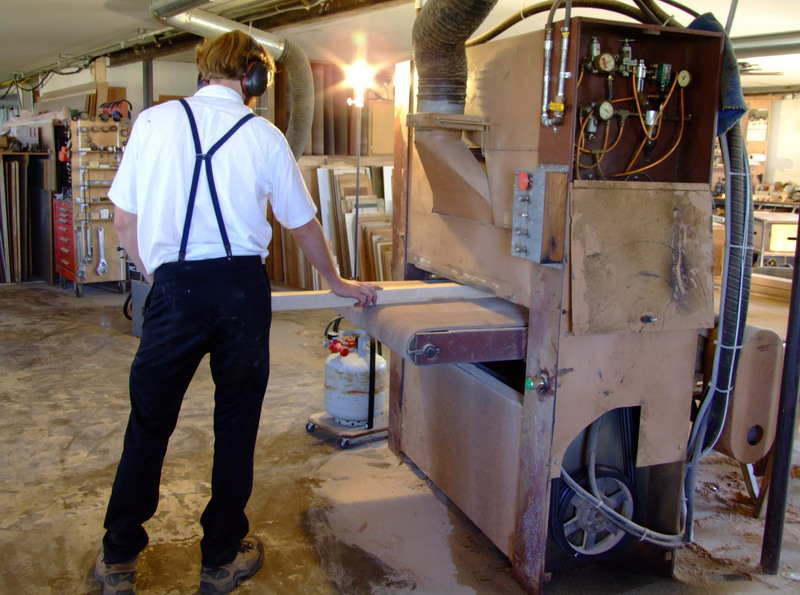 In an Amish furniture shop, this man works a large sander that has been converted from electric to hydraulic power. This electric-free workplace is illuminated by a propane light. 2007. 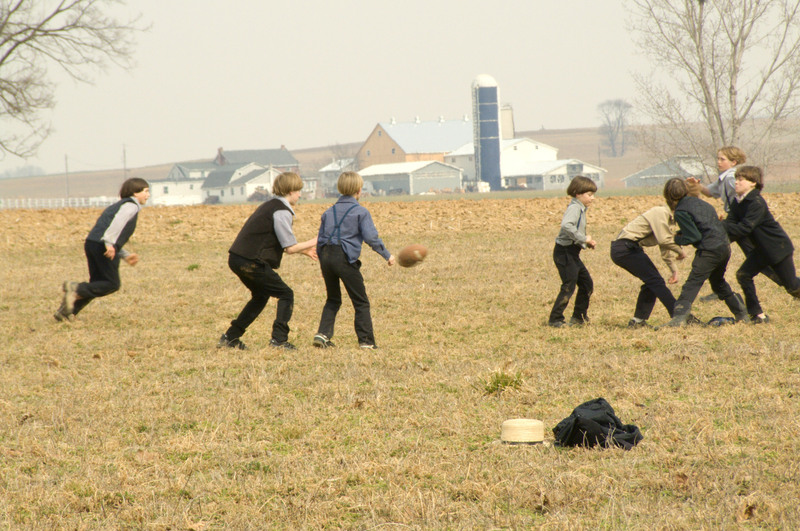 Amish boys play a game of pickup football near an Amish homestead. The most conservative Amish groups do not permit children to play football because it's considered a "worldly" sport. March 2009. A grandmother, mother, and two grandchildren ride in an open horse-drawn carriage. 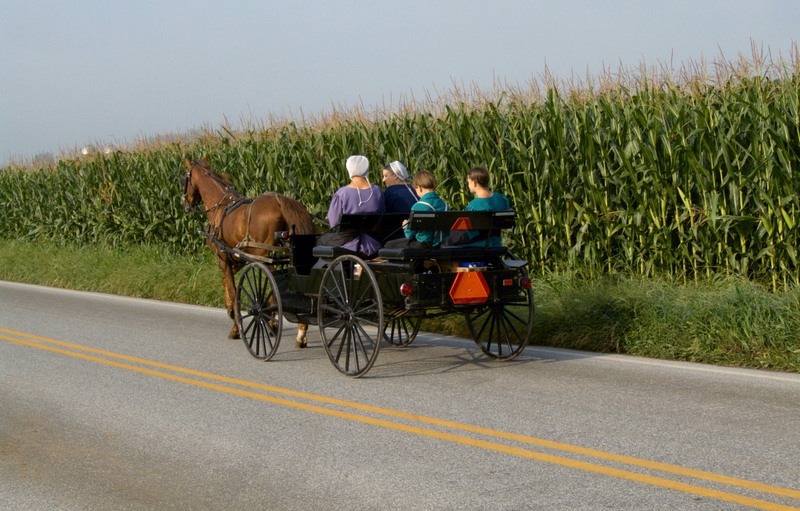 Most Amish groups use battery-powered lights and turn signals and affix a Slow Moving Vehicle triangle on the back of their carriage. Members of a few conservative groups have been arrested for refusing to place the triangle -- a government emblem -- on their carriages, which they consider religious symbols. August 2010. 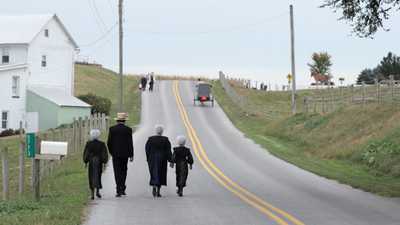 Without easy access to cars, many Amish walk to destinations in their neighborhood. 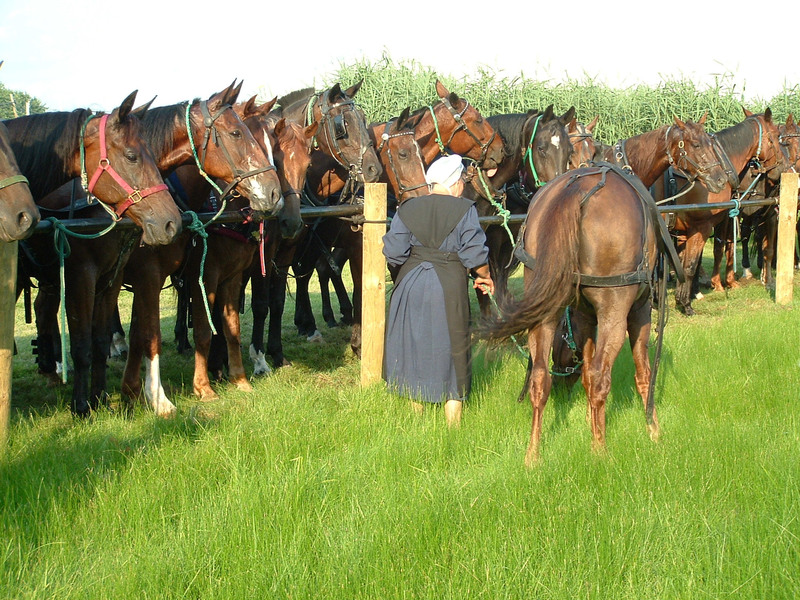 Amish women in all groups wear a head kapp with tie strings. September 2010. Although the styles and colors of women's clothing vary greatly from group to group, their fabrics usually do not have patterns or designs. It is typical to wear aprons with a waistband attached using straight pins rather than buttons. Historically, buttons were viewed as ornamental. Increasingly, some of the more liberal groups use buttons for everyday clothing but not for church dress. September 2010. 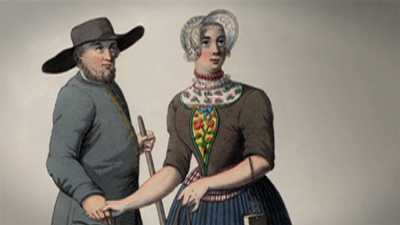 Thought a violation of the Second Commandment, which prohibits the making of "graven images," the Amish believe photographs of themselves promote individualism and vanity. Watch the opening scene of The Amish.